Today Club Med, the brand that pioneered the all-inclusive concept 65 years ago, unveils the latest development to the Club Med Punta Cana resort with a new Zen Oasis area, which has been designed with serenity in mind and is reserved for adult guests only. Zen Oasis Rooms: This tranquil escape features 78 brand new deluxe guest rooms with spa-like bathrooms boasting rainfall showers, large soaking tubs, soothing lighting, L’Occitane toiletries, and wellness amenities such as yoga mats. 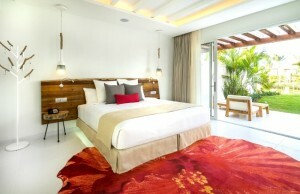 The rooms will also feature ample outdoor spaces with plush daybeds on private terraces or gardens for lounging. Sleek 49″ Smart TVs will provide guests with access to a complimentary movie library and Wi-Fi content connectivity, as well as access to personal Netflix and Spotify accounts. The Smart TVs will also include resort information via the Club Med app – a go-to resource for all on-property needs. Club Med CREACTIVE by Cirque Du Soleil: The resort recently launched Club Med CREACTIVE by Cirque du Soleil, allowing guests to learn up to 30 acrobatic and artistic circus activities. New Fitness Concepts and Facilities: Elevating the existing fitness offerings, a comprehensive gym renovation and expansion provides guests with new state-of-the-art equipment and innovative fitness concepts inspired by the latest exercise trends (Soul Cycle, CrossFit, Orange Theory and TRX). Tiara 5-Trident Luxury Space: Part of Club Med’s Exclusive Collection, the Tiara 5-Trident area of the resort has recently undergone a full renovation of the deck and pool bar, as well as updated lighting and furniture to further enhance the guest experience. Cortes & Pizarro Buildings Get a Refresh: All Club and Deluxe Rooms in the buildings have been fully renovated featuring new furniture, floors, paint and bathrooms. Located a stone’s throw from the Zen Oasis area, these rooms provide a great option for adult guests with families seeking to utilize Zen Oasis while children explore the resort on their own or as a part of the Children’s Clubs. For more information visit www.clubmed.us, call 1-800-ClubMed (1-800-258-2633) or contact a preferred travel professional. Travel agents may visit www.clubmedta.com. For an inside look at Club Med, follow Club Med on facebook.com/ClubMed, Twitter @ClubMedOfficial, Instagram.com/ClubMed or subscribe to YouTube.com/ClubMed.